Despite the ecological and growing commercial significance of cuttlefish, the successful management of these fisheries is hindered by the inability to assess population structure and connectivity. How many animals live in what places and how and when do they move between locations? While significant progress in recent years has improved our understanding of migration patterns of many cuttlefish populations worldwide, ways to track the young growing cuttlefish is a key priority for marine ecologists. This is the stage most influenced by environmental changes. 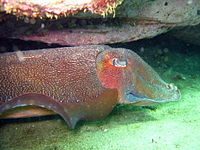 In this journal researchers, including the Environment Institute’s Professor Bronwyn Gillanders, evaluated the potential of mass-marking giant Australian cuttlefish Sepia apama hatchlings. To read more from this study, click here. This entry was posted in News, Publications and tagged Bronwyn Gillanders, cuttlefish, marine ecologist. Bookmark the permalink.